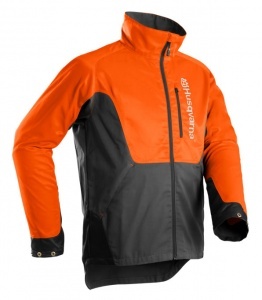 A great jacket to keep you visible & comfortable while doing occasional outdoor work. Husqvarna's Classic Forest Jacket is made from a comfortable & high-quality polyester/cotton twill and features high visibility orange panels and reflective logos. It includes both a chest pocket and two front pockets, plus cuff buttons so you can enjoy a tighter fit when operating a chainsaw in cooler weather.